The center fielder of the Tigers’ present and future was indirectly taking tips from one of the best, who played the position so well some 50 years prior. It was the summer of 2007, and Curtis Granderson, into just his second full season as the roamer of the vast expanse at Comerica Park, was having an impromptu lesson imparted to him. Granderson and I, an interloper at his locker, were chatting before a game against the Cleveland Indians, when coach Andy Van Slyke walked by and tossed Granderson a mitt. The outfielder’s glove had been recently re-laced, and that afforded Van Slyke an opportunity to pull it back from Granderson and jam it into his own hand, discussing the glove’s new laces and their length. Van Slyke flapped the glove open and closed, open and closed, while pantomiming the act of scooping up a baseball and throwing it back to the infield. Granderson laughed, but Van Slyke was serious—or so he said. Granderson didn’t know it, but he was being schooled, indirectly, by Bill Virdon. Virdon patrolled center field for the Pittsburgh Pirates with aplomb in the 1950s. And when Van Slyke was a young big leaguer playing in Pittsburgh, like Granderson in Detroit in 2007, it was Virdon who did the tutoring in Pirates camp. And now Virdon’s teachings were being passed on to the wide-eyed Granderson by Van Slyke as I looked on. Granderson was 26 years old at the time—with a kewpie doll face and a smile that lit up Woodward Avenue. 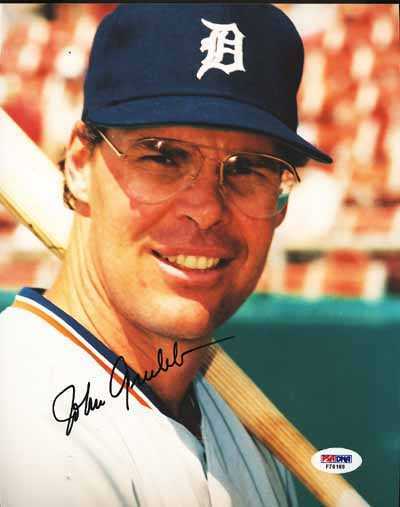 He beat out a speedster named Nook Logan just a year prior to claim the Tigers’ center fielder job. It was a job that Granderson was growing into very nicely, indeed. When we last left Curtis Granderson—and by “we,” I mean those who have an Old English D plastered across their heart—he was a bourgeoning star, slapping triples all around Comerica Park out of that nervous batting stance and robbing them with his glove. Granderson was going to play center field for the Tigers like Chet Lemon did before him, and like Mickey Stanley did before Lemon. And Granderson was going to stay with the Tigers forever. That last part is what the fans must have thought, anyway. Granderson was 28, seemingly just hitting his stride as an upper echelon center fielder, when the Tigers did the apparently unthinkable. On the heels of a terribly disappointing loss in Game 163 to the Minnesota Twins to close out the 2009 season, the Tigers made a blockbuster trade—a deal so big it took three teams to consummate it. Granderson was at the center of the trade, which landed the Tigers Phil Coke and Austin Jackson from the Yankees, and Max Scherzer and Daniel Schlereth from the Diamondbacks. The Tigers also gave up starting pitcher Edwin Jackson. Detroit baseball fans were aghast. Trading Curtis Granderson was considered blasphemy. He was a nice guy. A fine center fielder. A slapper of triples, a stroker of doubles, with a developing power swing. He smiled a lot. He was out there in the community year-round, helping out and becoming a Detroiter by proxy. He was going to play center field for the Tigers forever! It wasn’t just that Granderson was traded—it was that he was traded to the hated Yankees. He was too pure for New York. It was feared by yours truly that Granderson’s good deeds would be swallowed up and not really noticed in the Big Apple. Pinstripes never really looked good on him, in retrospect. They didn’t help his hitting. Oh, he hit his home runs in the new, cracker jack Yankee Stadium, where a pop fly to the second baseman could, with a gentle breeze, land ten rows up in the right field stands. But playing in New York ruined his swing. Granderson was soiled by Yankee Stadium. The tiny ballpark turned him into a free-swinging slugger. He used to be a gap-to-gap guy, spraying baseballs like a machine gun into the outfield, from left to right. As a Yankee, he became Adam Dunn. In his first season in New York, Granderson hit 24 home runs and his numbers were pretty much in line with what he did as a Tiger in 2009. But then Yankee Stadium’s poison infiltrated his system. In 2011 and 2012 combined, Granderson slugged—and that was the word for it—84 home runs, drove in 225 runs, and struck out 364 times. His batting averages for those two years were .262 and then .232, respectively. But he no longer hit doubles and triples all that much—44 and 14, respectively in 2011-12 combined, where with the Tigers Granderson averaged 29 doubles and 14 triples per season. And the lefty-batting Granderson never did learn how to hit left-handers after the trade to New York, against whom he has a career BA of .226. Seduced by the right field porch that he could seemingly reach out and touch from the batter’s box, Granderson turned from sprayer to hacker at the plate as a Yankee. He became, for the most part, a home run or strike out guy. This year, Granderson takes that poisoned swing from the Bronx to Queens, as a new member of the New York Mets. He signed with the Mets as a free agent after an injury-riddled 2013 season saw Granderson suit up for just 61 games with the Yanks. Granderson is soon to be 33 years old. To us in Detroit, that doesn’t seem possible. He still has the kewpie doll face but there’s some maturity to it now. He doesn’t look 33 yet he does, at the same time. He is moving into grizzled vet status. This year will be Granderson’s 10th in the big leagues. The man who would be the Tigers’ center fielder until he retired is now trying to revive his career in the National League, asked to be a mentor of sorts to teammates and fellow outfielders Eric Young, Jr. and youngster Juan Lagares. 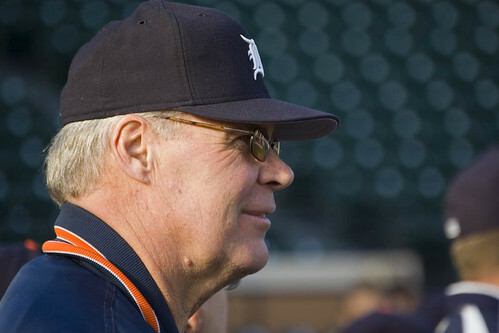 Granderson was a wide-eyed youngster once, getting impromptu outfield lessons from Bill Virdon by way of Andy Van Slyke via pantomime in the Tigers’ clubhouse. Time will tell if Granderson can smile the calendar into submission in his new pinstripes in Queens. And also, if he can regain a hitting stroke that, despite his nifty home run numbers, lost its way with the Yankees. Yankee stadium didn't change him. He was already a hacker in 2009'with the Tigers and that's why the trade was justified. Yankee Stadium definitely wasn't the problem. Granderson's bread and butter has always been hitting for average and his defensive skills. Anxious to see how things turn out for him with the Mets as well. That's a team that definitely needs more big names and star power. Tigers and that's why the trade was justified.